Not only promoters and private clients question architects’ abilities to design economic, yet high quality, houses. The young Paris based architecture office, Périphériques, have researched into the idea of the model house and produced the Icon House, which aims to satisfy the expectations of both the client and the architect. Although originally the house was born without a client - in fact, its source is based on the collective idea we all have of what a house is: a construction of four walls with 45º sloping roof - the model is able to offer different to versions that meet our personal characteristics. Périphériques decided to share their investigation with other young European architects. 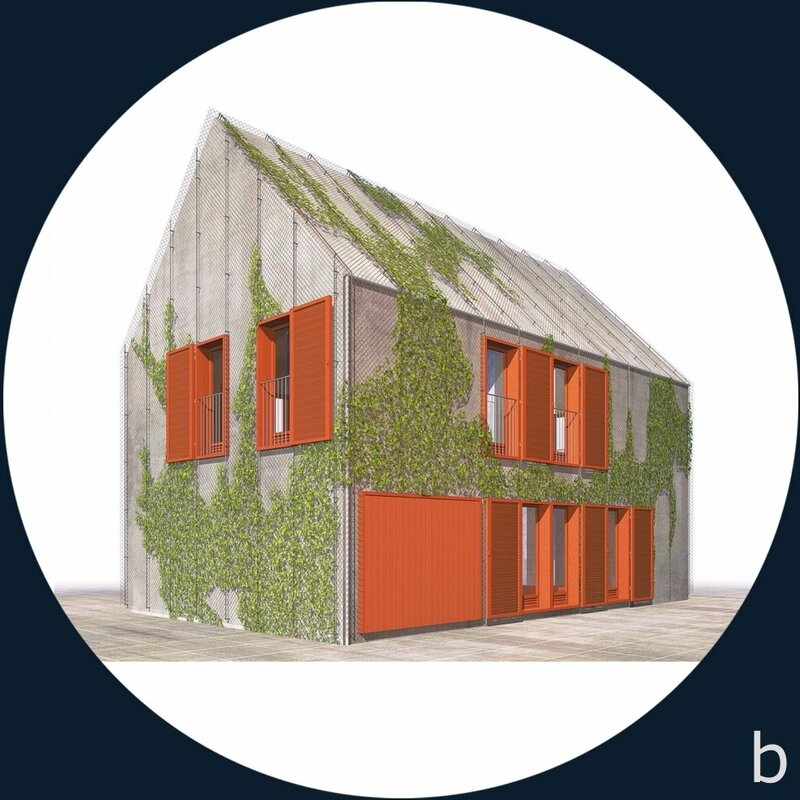 They asked almost forty teams to submit a project for a model house, of 80 square metres with a budget not exceeding 80.000 Euros, including the salaries of the architects. The end result was an exhibition, 36 Proposals for a Home, held at the Arc en Rêve Centre d'Architecture Bordeaux in the autumn of 1997. Each one of these 36 projects proved that it was possible to propose interesting schemes with a low budget. Many of them managed it by diverting standard contemporary materials from their original industrial purposes and using them for domestic designs. The group Périphériques insisted on the very important role the exhibition would have as a pedagogical experience for the general public. It travelled from Bordeaux to Barcelona, Glasgow and Paris, Besancon and Marseille, art centres and home architecture shows. Additionally, it was accompanied by an illustrative catalogue of which more than 10.000 copies were sold. Nowadays it is very hard to obtain one. Consequently, the investigation became known to a large audience who responded with hundreds of letters together with several commissions. Now, the exhibition forms part of the historical architecture collection at the Georges Pompidou Centre in Paris. Five years on from the exhibition the group Périphériques published Your House Now, a second book which illustrated 12 of the projects now built as homes and indicated where one could find The Icon House by Louis Paillard and Anne-Françoise Jumeau. The architects made the icon of a single-family house their starting point and used that preconceived image as a building component. Following this symbol, the house could be wrapped with wood, mortar, wire mesh, polycarbonate or whatever other material, depending on the budget and the taste of the clients. Moreover, avoiding the presence of elements like drainpipes, chimneys, balconies, or the dividing line between the facades and roof was a way of transforming a normal house into a surreal dream that retained its icon. The interior of this volume was determined by the maximum width of a 6 metres beam which allowed an economical unsupported span. In that way the structure became a shell that permitted flexibility in the interior to arrange the rooms. This was something which was already implicit in the exhibition where five versions of the interior layout for the Icon House were presented with the aim to encourage future inhabitants to personalise their spaces. 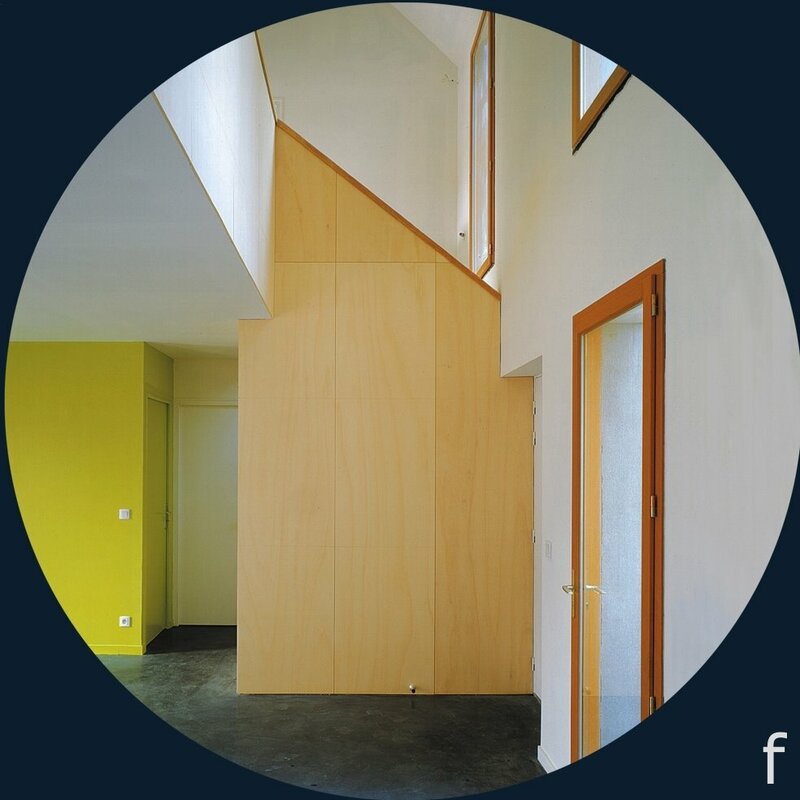 When the catalogue of the exhibition reached the hands of Véronique Decker and Emmanuele Derid, a couple highly involved in politics and consequently with a great capacity to negotiate, they decided to interview several of the architecture offices that had participated, with the aim of selecting designers for their new house. After series of meetings they chose the Icon House because, although it was a project for a “normal house”, it was not totally pre-determined. 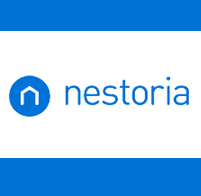 Furthermore, their relationship with the architects, already stated in the commission contract, was based on negotiation following the rules created by the icon. The family had a 522 square metres land in a working-class district in Montreuil, a town 5 minutes east of Paris. The conditions were nothing out of the ordinary. Their needs matched those of many other families: a big living room, five bedrooms, a kitchen, a study and a bathroom, all surrounded by a garden, as big as possible, and with a garage. They talked about the skin of house and the feelings they had about the wood. As if it was about building these conversations, the garden facade was built of phenolic wooden panels with diamond imprints which reproduced the wire mesh pattern that covered the rest of the house. These claddings and plants that cover and climb the roof and the walls make up a big garden which covers the house, hides gutters, drainpipes and vents and they transform it into a huge mystery. Inside the house, this same feeling appears in several details such as where plants cover small openings and where there is no need for curtains, or in the appearance of monumentality that is bestowed on the depth of the window frames and of the doors which exceed the thickness of the wall reaching the exterior space right to the metal mesh. 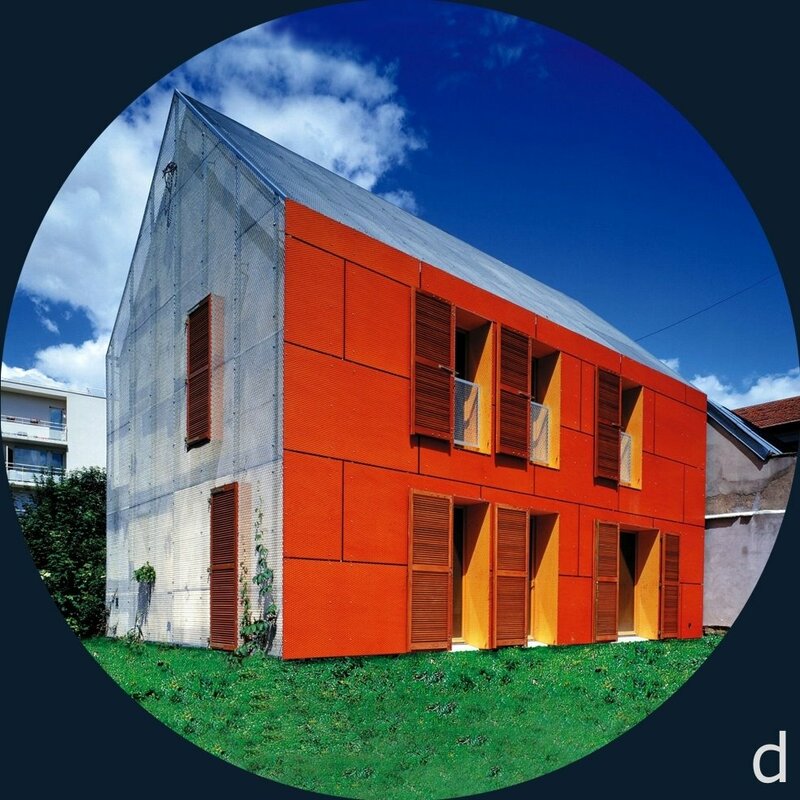 Although Périphériques designed the Icon House by responding to the question of collective memory - introducing the restrictive economic factor that affects the choice of cladding materials and the distribution of space - the final result responds to our particular icon of how one lives. A. Louis Paillard (b. 1960) and Anne-Françoise Jumeau (b. 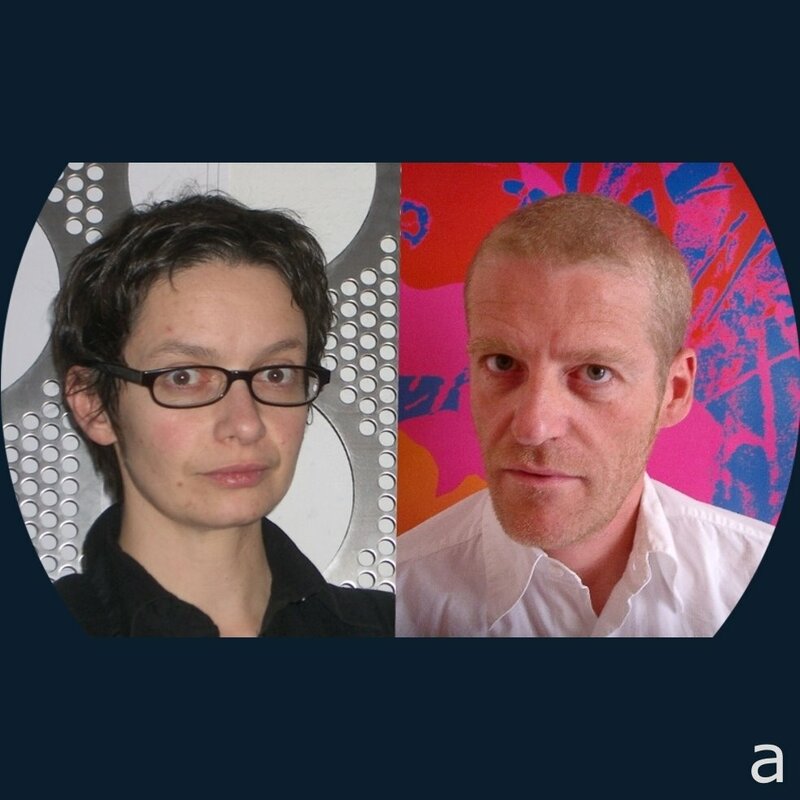 1962), members of the architectural group Périphériques, founded with Emmanuelle Marin and David Trottin in 1996. B. The claddings and plants create a big garden that covers the house and transforms it into a huge mystery. 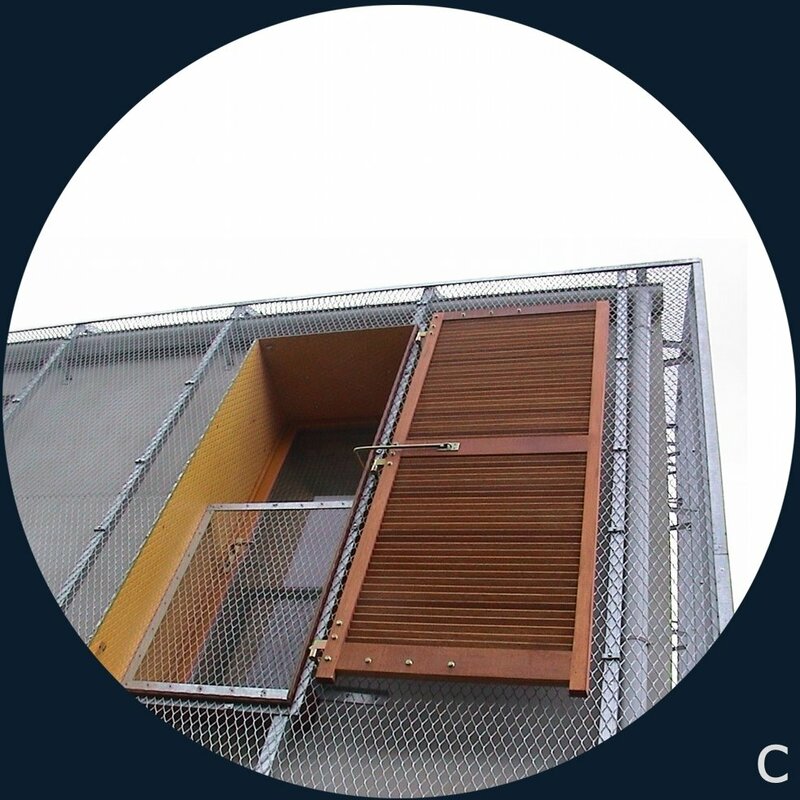 C. As well as exceeding the thickness of the wall, the depth of the window frames and of the doors reaches the exterior space right to the metal mesh. D. The garden facade was built of wooden panels with diamond imprints which reproduce the wire mesh pattern that covers the rest of the house. 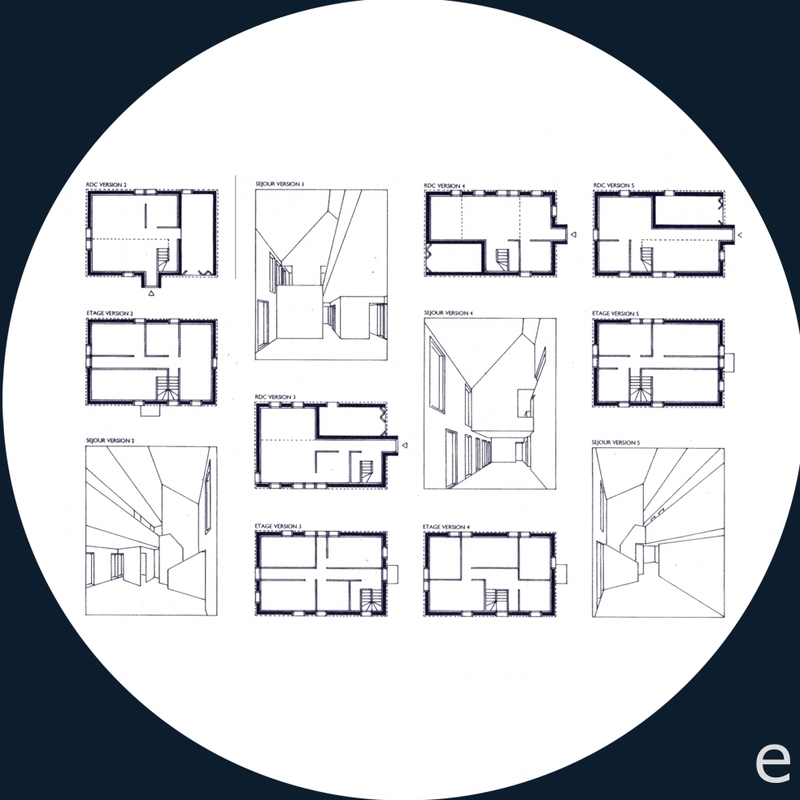 E. The Icon House (2002) is one of the many variations of the project presented in the exhibition 36 Proposals for a Home. F. The clients had wished for a big living room and a kitchen downstairs, which were connected to the bedrooms overlooking the garden in the back with a combination staircase/furniture in wood.